The SP-500 and DJ-30 both finished the week with small gains, while the COMPQX found major buying, ending the week up 113 pts for a 1.84% gain. This is not surprising as the 3100 stocks in the Nasdaq are made up of the leading super stocks like AMZN, GOOGL, TSLA, etc. As we stated last week, “The STH reset last Friday morning, and is just now coming out of the buy area, giving us odds that we could see higher prices in the market this week, possibly as soon as tomorrow”. And this is exactly what we saw with all 3 of the major indexes gapping up to begin the week. The institutional buyers continue to show an appetite for the tech industry and consumer sectors. In addition, leading stocks from each group have been making significant moves upward in price. The tech industry is quickly recovering most of the gains it lost back on the June 9th “Tech Wreck”, which is a strong indication the bull is alive and well. Long Term Herd: The LTH is finally back to a buy area giving us good odds that we will see higher prices this week and possibly next week as well. Bull Market Status: July has averaged a 4.2% gain since the bull market started in 2009. From 1950 thru last year, July has been up 37 times, and down 30 times. What does all this mean? Nothing, as they are just averages. But in statistical terms, July can be a pretty good month in a bull market. The “growth” stocks have been leaders for most of this bull market, and currently, nothing has changed. The leading stocks are still showing institutional buying and broad support. Amazon – AMZN opened the week with a gap up of almost 3% and made a new ATH at $1017. This stock is up almost 222% since it broke out of its downtrend back in January of 2015. That’s an annualized gain of 62.85%, just another reason why I only follow and trade the super-stocks! Higher prices ahead. 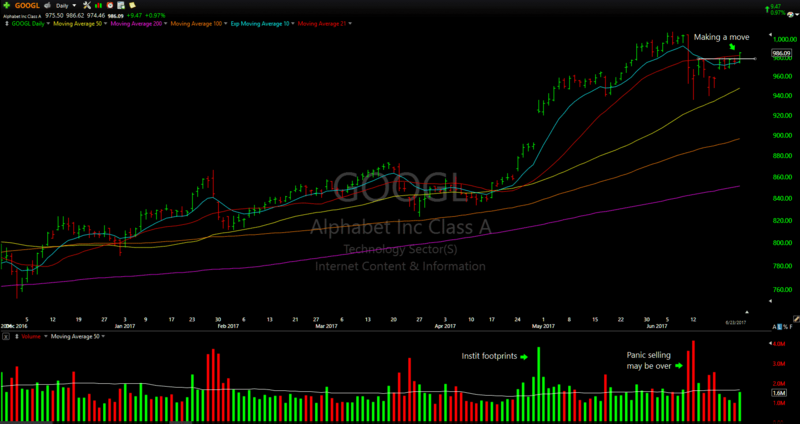 Google – GOOGL found the buy area last week finishing up 2.87% since our last Sunday’s newsletter suggestion to watch for higher prices. In addition, the stock broke thru its previous line of resistance and its 21 dma on Friday, both signs of strength for this tech giant. Keep an eye on this stock as it gets ready to make its next big move up. 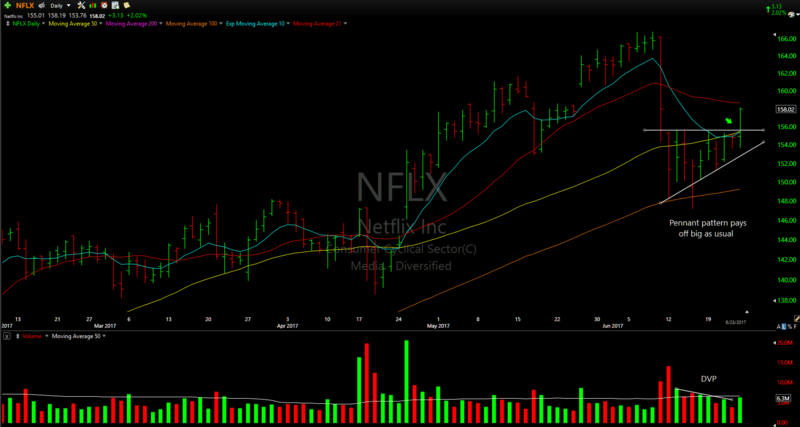 Netflix – NFLX continues to show strength as it broke thru a previous line of resistance and also broke out of a pennant pattern on Friday. Higher prices are anticipated over the next 1-2 weeks. 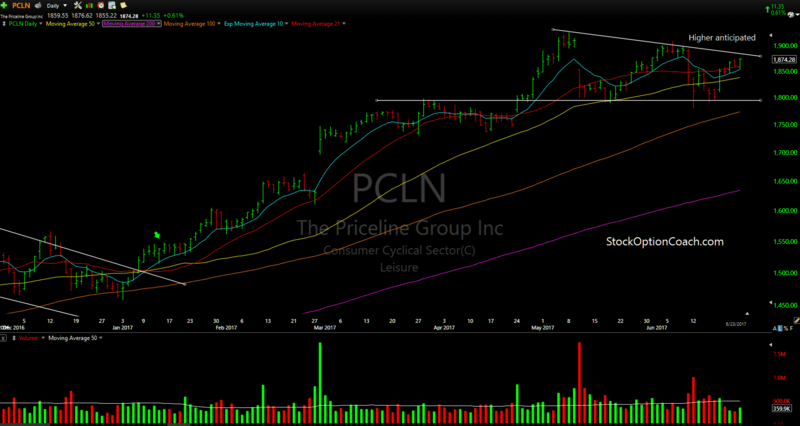 Priceline – PCLN, Higher prices are anticipated for Priceline as this stock looks to break out of its pennant pattern. 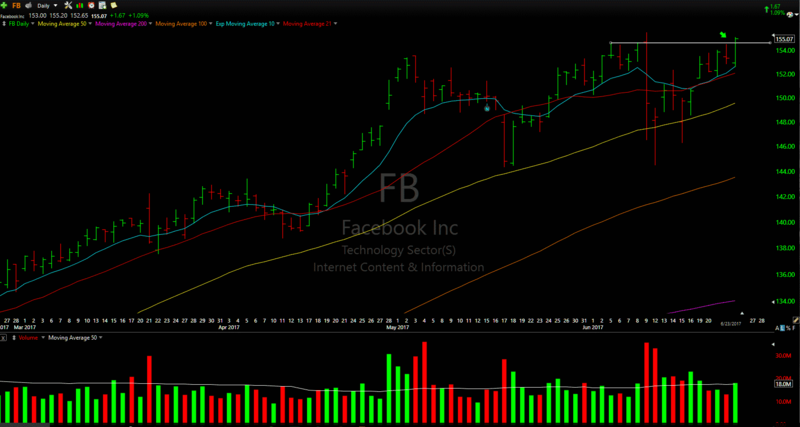 Facebook – FB, Just as we expected, Facebook found higher prices this past week. FB finished the week with the highest close in this stock’s history at $155.07, as it broke thru previous resistance after finding support at the 10 dma. This could set us up for another run as the stock looks to break it’s intraday ATH of $155.59. 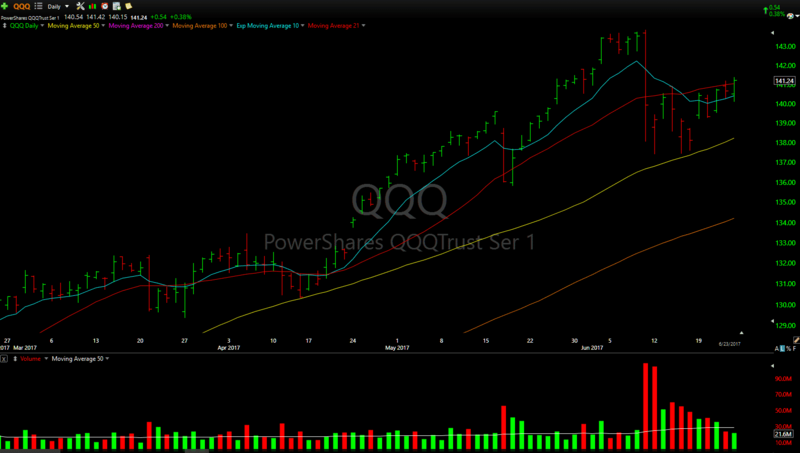 PowerShares QQQ Trust – As we anticipated, the QQQ’s saw higher prices for a weekly gain of 2.24%. Higher prices likely this week. 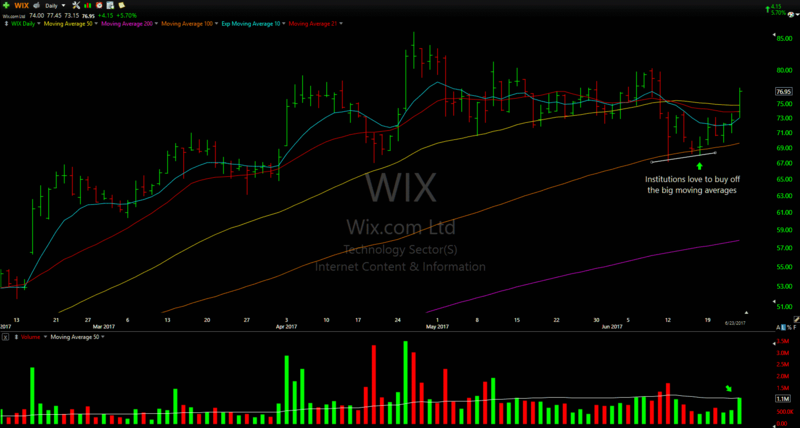 Wix.com LTD – WIX is up approximately 13% since the bounce off the 100 dma that we identified in last weeks newsletter. The stock closed the week out strong as it bounced off the 10 dma and broke thru its 50 dma. May need a few days to breathe, but if the market shoots up, expect this stock to follow. 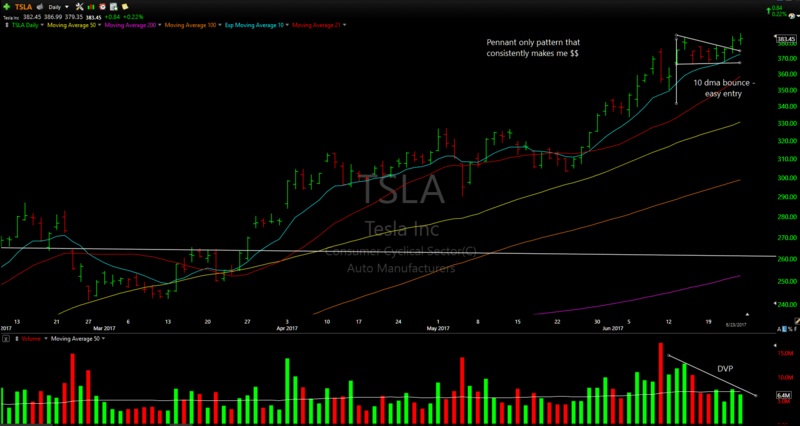 Tesla – TSLA had an easy entry midweek at its 10 dma bounce, as it went on to break out of its bear flag pattern. Friday’s close is the highest in TSLA’s history… can you say bull market?! Higher prices anticipated. 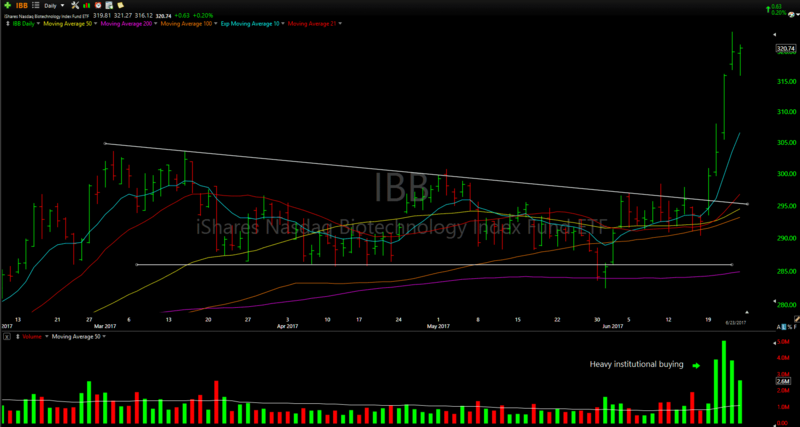 iShares Nasdaq Biotech Index – IBB found support at the 100 dma with heavy institutional buying driving the stock’s price to its highest point since Jan. 15, 2016. Russel 2000 Index – IWM, The small caps have been trending sideways for the past 7 months, but this could finally be their time to make a move as we’ve already had 3 false breakouts. 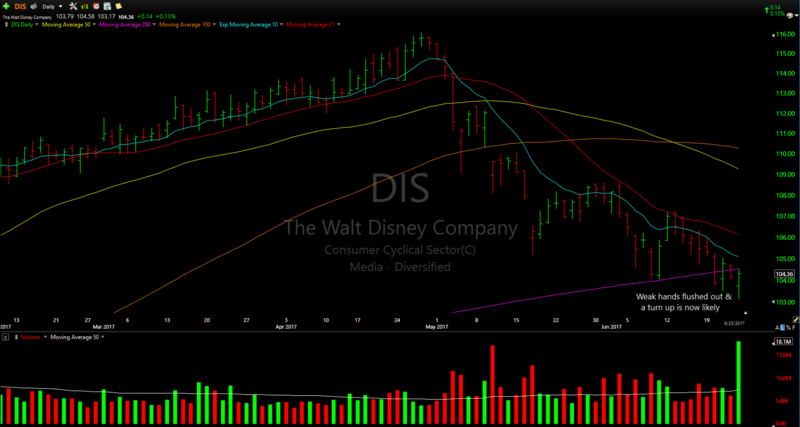 Disney – DIS looks ready to finally reverse its downtrend. Higher prices are likely this week. Do you feel the need to make predictions? In my opinion, it’s a waste of time as tomorrow’s price is unknowable. All we have to do is follow price action and let the market tell us what to expect. The Merriam-Webster dictionary defines a Prediction as: Soothsaying, Prophecy, Prognostication, or Guess. For me, the last one, “Guess” sums it up. OK, soothsaying might even be more accurate. Any prediction of the market, stocks, or index is really nothing but a guess. An opinion. Would any of the CNBC pundits bet their entire 401K on their own prediction? No, and the answer is always the same. Because it’s just an opinion or a guess. The day you understand this is a game of odds and probabilities, and how to play the odds, is the day you become a trader who can succeed in trading for a living! If you have not read the book “Outwitting the Devil”, you should. This book is not about religion. This book is by Sharon Lechter, who was the co-author of Rich Dad – Poor Dad. The book is a manuscript of Napoleon Hill’s from 1938, written after his famous book “Think & Grow Rich”. Here is an excerpt from the book: “Faith is the beginning of all great achievement. If Edison had stopped by merely wishing for the secret with which energy might be harnessed and made to serve through the incandescent lamp, that convenience to civilization would have remained among nature’s multifarious secrets. He met with temporary defeat more than 10,000 times before wrestling this secret from nature. It was finally yielded up to him because he believed it would be, and he kept on trying until he had the answer”. “This much I do know, that there is a power or a first cause, or an Intelligence which permeated every atom of matter. It embraces every unit of energy perceptible to man. This Infinite Intelligence converts acorns into oak trees & causes water to flow downhill in response to the law of gravity. It follows night with day, and winter with summer, each maintaining its proper place and relationship to the other. This intelligence may aid in transmuting one’s desire into concrete or material form. I have this knowledge because I have experimented with it and have experienced it”. To summarize this, faith in everyday trading is extremely important as you build your skill set. Everyone experiences bumps in the road, ups and down, highs and lows. The trader who can maintain a steady winning attitude, regardless of results, will win in the long run! Remember to take what the market will give you, don’t force any trades, and always use a stop loss. I hope everyone has a great week of trading!